For many years, the METACONCEPT Group has been a leading supplier for manufacturers and repairers of heat exchangers. Thanks to this favourable position, it has been able to follow the constant development of aluminium radiators and implement a complete range of welding products suited to the profession. These filler metals are also used in all kinds of industrial applications where aluminium-silicon based alloys need to be welded. TIG rod : Filler metal, in rod form, for TIG welding (Tungsten Inert Gas) aluminium-silicon alloys. MIG wire : Filler metal, in wire form, for MIG welding (Metal Inert Gas) aluminium-silicon alloys. This process is in direct competition with the MMA welding. It is the most frequently used welding process in the 21st century. METALU rod : Non-corrosive, flux-cored wire, in rod form, for flame brazing or welding aluminium-silicon, aluminium- copper and aluminium-brass alloys. This table shows the most commonly used alloys for inert gas welding. Dimensions and weights are given for informational purposes only and may vary depending on the production run. Have you defined the type of application? Contact us, our staff will be happy to assist you in deciding which alloy to choose. gas welding. Filler metal, in rod form, for TIG welding (Tungsten Inert Gas) aluminium-silicon alloys. Very good fluidity. Process mainly used for repairs or small production runs. Welding and repairing aluminium with 5% magnesium and alloys of similar grades. Application types: heat exchangers, aluminium alloy air conditioning condensers. Connecting aluminium and aluminium alloy pipes. Light sheet ￼metal work, rail and automotive industries, skips and tractor trailers. Frequently used for repairs to casting parts or poorly defined grades of aluminium as often encountered when maintaining agricultural equipment. gas welding. Filler metal, in rod form, for TIG welding (Tungsten Inert Gas) aluminium-silicon alloys. Very good fluidity. Process mainly used for repairs or small production runs. Heat exchangers, aluminium alloy air conditioning condensers. Connecting aluminium and aluminium alloy pipes. Light sheet metal work, rail and automotive industries, skips and tractor trailers. Often used in naval constructions due to its excellent resistance to corrosion in marine environments. MIG Al Si5 wire Filler metal, in wire form, for MIG welding (Metal Inert Gas) aluminium-silicon alloys. Very good fluidity. This type of brazing lends itself to total automation using a robotic installation. High yield in continuous welding. It is also used to obtain thick beads. Heat exchangers, aluminium alloy air conditioning condensers. Connecting aluminium and aluminium alloy pipes. 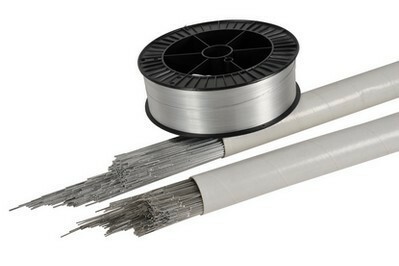 Flux-cored wire Filler metal, in rod form, used when flame brazing aluminium and some of its alloys, with 18 – 10 type stainless steel and aluminium with copper. Non- corrosive flux, therefore no cleaning is required after brazing. Very effective solder for repairing leaks from aluminium radiator pipes (motorbikes, air-conditioning units, oil-cooled radiators). It is also used to repair parts made from copper or brass combined with aluminium. TIG welding falls under the category of arc-welding procedures using a non-fusible electrode. The arc is created between the refractory electrode and the part under the gaseous flux; generally, this is a gas or a mixture of noble gases. Priming occurs thanks to the gas flowing through the nozzle which surrounds a large portion of the electrode. TIG welding is carried out with straight polarity (“–” pole of the generator connected to the electrode) for most metals and alloys (steel, stainless steel, coppers, titanium, nickel, etc.) except in the case of light aluminium or magnesium alloys which are welded with alternating polarity (the electrode is connected to the “+” pole of the generator for a period of time). It is important to note that continuous welding with straight polarity (“+” pole connected to the electrode) destroys this electrode by melting it. For MIG welding, it’s the wire that creates the arc and serves as the fusible electrode for the parts being assembled. The METALU solder is very easy to use because of its excellent fluidity and wettability when molten and the pickling leaves no active residue. Use an oxyacetylene blow torch (melting point of 450°C). Heat the parts to be assembled to a temperature of around 480°C and melt the flux-cored wire in contact with the joint requiring brazing. Do not smoke at the workstation. The workstation must be well ventilated. Wash your hands when leaving the workstation. Always use a flux suited to the intended use. Contact our technical department to ascertain which product is most suited to your application. All of the information contained in this document is provided for informational purposes only and the METACONCEPT Group will not be held liable for it.